A common Mennonite combination for picnics is watermelon with rollkuchen (fried bread). 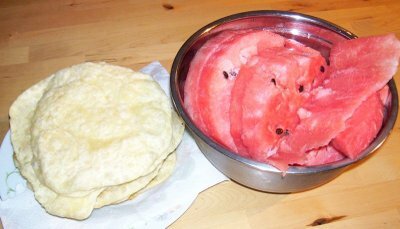 The saltiness of the fried bread wonderfully complements and enhances the sweetness of the watermelon. I was surprised to find a recipe for this online, Indeed, googling rollkuchen resulted in dozens of links, of which a few mentioned this particular combination. I liked the one found at Recipezaar. Having bought a large watermelon, one with seeds (I HATE the idea of modifying fruit to make it seedless--more on that some other time), I remembered fondly one particularly large picnic gathering we had when I was about 7 or 8. Coming from a large family (I'm the youngest of 6 surviving children) with aunts and uncles with equally large families, our family gatherings could be a huge affair. Even with only two families meeting for a picnic, as was the case this time, the group was fairly large. The main dish--I think the only one--consisted of watermelon and rollkuchen. There were two huge bowls on the table, one filled to overflowing with sliced watermelon, the other, equally overflowing, with rollkuchen. Delicious! Being vegan, the recipe for rollkuchen doesn't work. 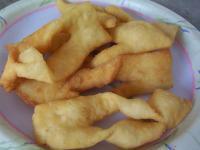 It contains both eggs and dairy, and is often fried in animal fat, or vegetable oil in which meat has also been fried. It also makes for a very oily (from being fried) and rich (starch, fat, cholesterol) snack. Having expanded my diet far beyond the confines of the Menno-Mexican cuisine of my childhood, often fusing it with elements of Chinese, Indian, and Lebanese cuisine, I thought of substituting an Indian fried bread for the rollkuchen. Puri is not as crispy as rollkuchen, but does also puff up nicely. The great benefit of puri over rollkuchen, though purists would probably say its all part of the package, is that its ingredients are considerably less fattening, though the taste is great. Of course they are still fried, so don't have it too often if concerned about fat content. I got my puri recipe from one of my Indian cookbooks, Indian Vegetarian Cooking, by Michael Pandya. 1) Rub the flour and salt together with two teaspoons ghee. Add water as necessary to make a stiff dough. 2) Divide dough into 12 portions (18 if you want small puris); roll each one out into a thin, round disk. Cover with a damp cloth while the kadhai is being organized. 3) Heat sufficient ghee in a kadhai, or a deep frying pan, to smoking point. Slide in 2 discs at a time and deep-fry until brown on both sides. A puri takes no more than a minute to cook. When the puris are done, remove, and place on paper towels. Serve hot. Although the taste is obviously quite different, and puris are not as crunchy as rollkuchen, the combination works very well. We thoroughly enjoyed our picnic-like meal. It occurred to me afterwards that I could have tried shaping the puris to look more like rollkuchen. It also occurred to me what a neat cultural fusion this simple meal represents--Indian fried bread in a Mennonite-style combination.